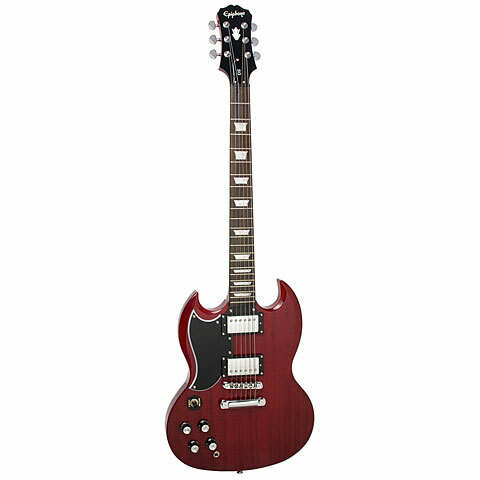 The G-400 is one of the most successful guitars in the SG-Serie. This has resulted in Epiphone bringing a few new versions on the market. It is also available in Translucent Blue with gold Hardware. 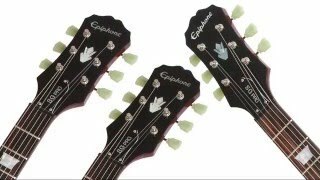 The G-400 „Gibson-Specs“ has original Gibson Hardware and the colour „Heritage-Cherry“, the G-400- Korina has a Korina body and gold-plated Hardware. The G-400 Custom comes with 3 Humbuckers, gold hardware and the „original“ Les Paul script built on the Truss Rod. Last but not least the guitar comes in the colours Black and Antique Ivory. But other than that they are just like the Original! These guitars are also available in a left-handed version in „Cherry“. A totally new edition to the series is the G-400 Deluxe. It has the same characteristics as the „normale“ G-400 plus a flame maple top. It comes in the colour Vintage Sunburst. Dit product is met gemiddeld 4.7 van 5 sterren beoordeeld. Er is 1 schriftelijk rapport opgegeven. Deze teksten zijn geen weergave van de mening van Musik Produktiv maar een beoordeling naar subjectieve indrukken van onze klanten. 36 Beoordelingen zijn zonder tekst opgegeven of in een ander taal geschreven.